Goliath’s Revenge is the practical guide for how executives and aspiring leaders of established companies can run the Silicon Valley playbook for themselves and capitalize on digital disruption. Technologies like artificial intelligence, robotics, internet of things, blockchain, and immersive experiences are changing the basis of competition in every industry. New competitors are emerging while traditional ones are falling behind. Periods of intense change provide remarkable opportunities. 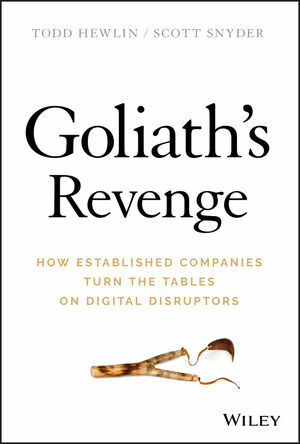 Goliath’s Revenge delivers an insider’s view of how industry leaders like General Motors, NASA, The Weather Channel, Hitachi, Mastercard, Proctor & Gamble, Penn Medicine, Discovery, and Cisco are accelerating innovation, building new skills, and disrupting themselves to come out stronger in this post-digital age. Learn how to leverage your company’s scale, reach, data, and expertise to launch breakthrough offerings that fend off attackers and secure your position as a future industry leader. Using real success cases and recommendations, this invaluable resource shows how to realign your business model, reset your talent development priorities, and retake market share lost to digital-ready competitors. Drawing from extensive experience in digital transformation, leadership development, and strategic planning, the authors show how established companies can switch from defense to offense to thrive in this new digital environment. Goliath’s Revenge is a must-read for business leaders and innovators in small, mid-sized, and large organizations trying to win the digital disruption game. This book helps you reset both your company strategy and professional development priorities for long-term success. TODD HEWLIN is a Managing Director at TCG Advisors, the leading growth strategy firm in Silicon Valley, and a noted expert on digitization and business model innovation. He is co-author of Consumption Economics and B4B and a frequent speaker at major industry events. SCOTT SNYDER is a Partner at Heidrick Consulting and a recognized thought leader on digital transformation and innovation. Scott is a Senior Fellow at the Wharton School, founded three start-ups, and held leadership roles at GE, Lockheed Martin, and Venture firm Safeguard.